Several regressive legislative proposals pose a threat to Indigenous land rights, experts warn. Leaders and organizations directly involved in the struggle for Indigenous land rights warn that territorial disputes will escalate during the 2018 legislative period. The executive secretary of the Indigenous Missionary Council (CIMI), Cleber Buzatto, predicted an intensification of legislative proposals, which seek to delegitimize Indigenous peoples claims to traditionally occupied territories. Buzatto attributed this to the overwhelming influence of Brazil’s powerful corporate agriculture lobby. “We need to be more attentive because it is very likely that the Rural lobby group will seek to approve bills that serve their interests,” He stated. 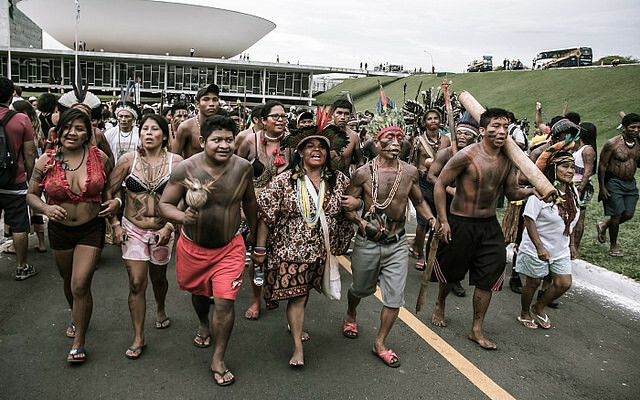 During 2018, Brazil’s national congress is set to discuss a number of legislative proposals that if approved would compromise and infringe upon the rights of indigenous peoples including legislative bill 3.729/2004. Critics argue that the bill would weaken environmental licensing standards for large-scale infrastructure projects in an effort to expedite the authorization of infrastructure-related permits. Meanwhile, the second proposal, known as bill 4059/2012, is a measure that would deregulate the current restrictions placed on the sale and purchase of Brazilian land by foreign entities. Activist Paulino Montejo, with the Association of Indigenous Peoples of Brasil (APIB), confirmed that Indigenous communities across the country worry that these bills would pose a threat a serious to their traditionally occupied territories. “The biggest problem is the issue of territorial disputes. There is a deep seeded fear among our peoples right now. Indigenous people feel, once again, as if we are a currency used to serve the interests of corporate agriculture and of this government,” Montejo stated. The issue of territory, is directly tied to the Constitutional Amendment Proposal (PEC) 215, which if approved, would transfer responsibility powers from FUNAI to the Brazilian congress, whose members are heavily influenced by agribusiness interests. Last December, members of the Parliamentary Agriculture and Livestock Front, which holds strong ties with Brazil’s industrial agriculture bloc, announced that PEC 215 will be a key priority in the upcoming months. In response, Congressman Ságuas Moraes of the Workers Party (PT) argued that the proposal is in violation of Article 68 of the 1988 Brazilian constitution, which for the first time recognized the right of Indigenous peoples to receive lands from the state. "It unconstitutional because it undermines a fundamental clause of the Federal Constitution, which guarantees indigenous peoples' right to land," Moraes stated.